Manipur elections results 2017: The state is currently governed by Congress with Okram Ibobi Singh as the chief minister who has held the position since 2002. From left, CM Okram Ibobi Singh, PM Narendra Modi and Irom Sharmila. Manipur is headed for a hung assembly as none of the political parties managed to reach the magic mark of 31 for securing majority. While Congress secured 28 seats, the BJP produced a creditable performance winning 21 seats in the north-eastern state. Meanwhile, National People’s Party and the Naga Peoples Front bagged four seats each, while Lok Jan Shakti Party won a seat. All India Trinamool Congress also managed to bag one seat. Chief Minister Okram Ibobi Singh overcame anti-incumbency as he defeated L Basanta Singh of BJP by 10,400 votes to win from Thoubal Assembly seat. 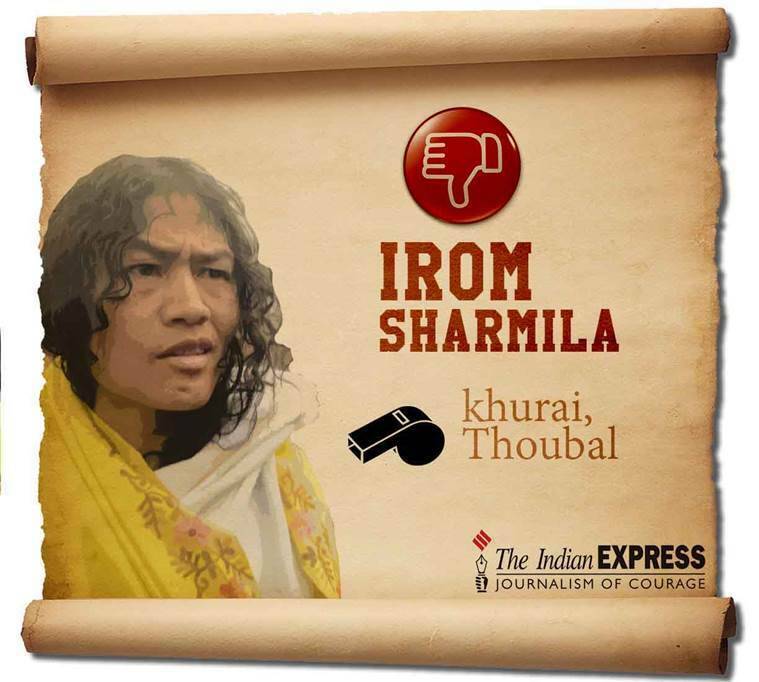 Rights activist Irom Sharmila, who had contested against the Chief Minister, was relegated to fourth position after securing only 90 votes. After her dismal performance in the assembly elections, Sharmila announced that she would quit politics but vowed to continue her fight against the AFSPA in the state. Among other prominent candidates, N Biren Singh, a key BJP leader, emerged victorious from Heingang Assembly seat. Sapam R Singh and Heikham Dingo Singh were the other prominent BJP nominees who won the election. Singh has held the position of Chief Minister since 2002. Despite the prevalence of anti-incumbency during 2012 elections, the Congress party under Ibobi Singh managed to sweep the Manipur polls with 42 out of 60 assembly seats. 08:00 pm: That’s it for now. Live updates end here. 07: 40 pm: Naga Peoples Front, which won four seats in the assembly election, is likely to support a non-Congress government, reports ANI. 07: 17 pm: The BJP witnessed its vote share jump manifold in the last 25 years. The party’s vote share was 36.1 per cent in Manipur whereas the vote share was just 3.35 per cent back in 1995. BJP’s commendable performance in Manipur is a testimony to BJP’s commitment to North East & PM @narendramodi‘s vision to develop the region. 07:00 pm: According to official figures by the Election Commission of India, the Congress has won 26 seats, while BJP has managed to secure 20 seats with leading in two more states. 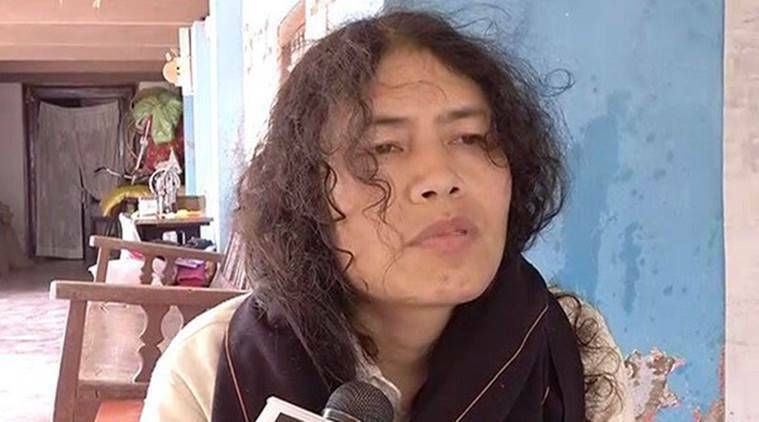 06: 53 pm: After being relegated to fourth position in the Manipur assembly elections, human rights activist Irom Sharmila has announced that she would quit politics but vowed to continue her fight against the AFSPA in the state. 06:30 pm: The Congress has won 25 seats and leading in one other seat, while BJP managed to secure 20 seats. 05: 29 pm: Congress has secured 24 seats, while the BJP won 20 seats as results of 55 out of 60 seats have been declared so far in the state. 05:10 pm: As per the latest update, the Congress has bagged 23 seats, while the BJP is trailing close with 19 seats. 04: 29 pm: The Congress has won 21 seats while the BJP secured 18 seats as results of 47 out of 60 seats have been declared so far in the state. BJP’s electoral gain in Manipur is a reiteration of support by the people of the North East for PM @narendramodi ji’s ‘Act East’ policy. 04: 05 pm: As per latest updates, BJP is leading in five seats while the Congress is leading in four. 04: 00 pm: Addressing a press conference, BJP chief Amit Shah has expressed confidence that the party will form the government in Manipur. 03: 52 pm: The Congress has taken a two-seat lead over BJP as results of 44 out of 60 seats have been declared in the state. 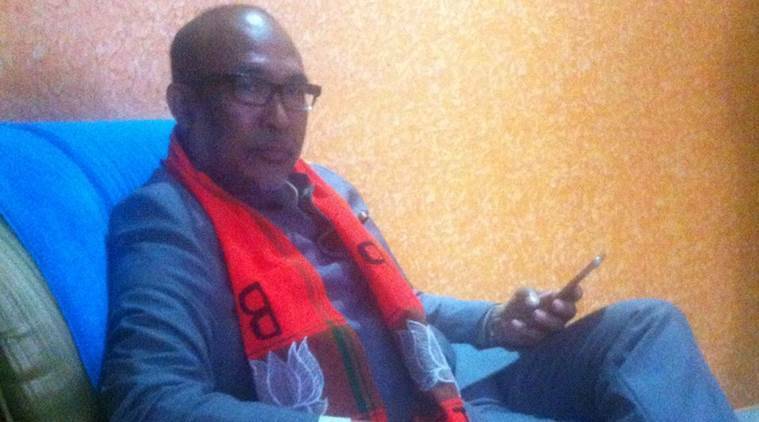 03: 48 pm: Former Congress minister and BJP candidate from Heingang Assembly seat N Biren Singh wins by a margin of 1206 votes, PTI reports. 03: 45 pm: Congress edges ahead by winning 18 seats as results of 43 out of 60 seats have been declared in the state. 03:35 pm: Both the Congress and BJP have secured 17 seats each as the results of 42 out of 60 seats have been declared so far in the state. 03: 30 pm: Meanwhile, the Naga People’s Front and National People’s Party have won three seats each with the latter leading in one other seat. 03: 20 pm: The results of 41 out of 60 seats have been announced with the BJP taking a slender leader of one seat over Congress. The BJP has won 17 while the Congress has secured 16 seats so far. 03: 15 pm: Congress leader Rajkumar Imo Singh defeated BJP’s Dr K Loken Singh by a mere margin of 19 votes. In spite of the win, Congress is trailing behind BJP with registered wins in 15 seats, while BJP has won 16 seats in the state. The results of 38 seats out of 60 have been declared in the state. 03:10 pm: As per the latest update, the Congress and the BJP are racing neck and neck. While the BJP won 16 seats, the Congress has secured 15 seats so far in a closely-fought election. 02.40 pm: The Bharatiya Janata Party has won 14 seats and leading in 6 constituencies. While Congress has also won 14 seats. 02. 35pm: KM. AK. Mirabai Devi won from Congress by beating Sapam Kunjakeswor(Keba) Singh from North East India Development Party by 114 seats. 02.30 pm: BJP has won 11 seats, Congress has won 14 seats, while BJP is leading in 7 constituencies, Congress has taken a lead in 6 constituencies. 2:05 pm: Scenes from Manipur from where counting of votes in underway. 1:57 pm: BJP’s L Susindro Meitei won from Khurai constituency, which is the hometown of PRJA leader Irom Sharmila. Meitei defeated Congress’ N Bijoy Singh by a margin of almost 2000 votes. BJP’s T Radheshyam Singh also defeated Congress’ Moirangthem Okendro to register a win in Heirok constituency. 1:40 pm: According to EC website, results of 28 seats out of 60 have been declared in the state. Congress has currently won 11 seats, while BJP has won 10 seats. NPF has won 3 seats and NPP has won 3 seats each, while LJP has won one seat. 1:35 pm: BJP state President Chaoba trailing. Chaoba wished to be the chief ministerial candidate, and if he loses, it means the chief minister’s seat will be up for grabs. If BJP crosses 20 seats in Manipur, then they are expecting decisive victory. 1:30 pm: According to latest trends: BJP- 14, INC- 13, NPP – 3, LJP- 1, NPF 2. NPP and LJP are BJP allies which puts them in the lead. 1:22 pm: BJP spokesperson N Biren, who was former Congress minister, wins from Heingang assembly constituency. 1:20 pm: BJP won three seats as S Subhaschandra Singh defeated Congress R K Anand in Naoriya pakhanglakpa constituency while Rajen Singh won from Lamsang beating Congress candidate W Brajabidhu Singh and Samuel Jendai Kamei won from Tamenglong. LJSP Karam Shyam defeated BJP’s Joy SIngh in Langthabal, opening account for the party in the state. , while Congress’ Oinam Lukhoi Singh registered a victory in Wangoi constituency. 1:12 pm: BJP won its fifth seat in the state as V. Hangkhanlian won from Churachandpur constituency, with NPP’s Phungzathang Tonsing coming behind in second position. 1:05 pm: An emotional Irom Sharmila broke down after after losing elections in Thoubal. Speaking to Indian Express, the activist said that she will never contest elections again. 1:00 PM: BJP’s Sorokhaibam Rajen Singh won its 4th seat from Lamsangm beating INC’s W Brajabidhu Singh by 1280 votes. Meanwhile, Congress D. Korungthang defeated BJP Yangkholet Haokip defeated NPP’s Letpao Haokip has won from Chandel constituency beating independent candidate TS Warngam by over 2000 votes. Congress leader D. Korungthang has beaten BJP’s Yangkholet Haokip in Tengnoupal constituency by over 4500 votes to register 9th seat for Congress. 12:55 pm: BJP national secretary Ram Madhav was interviewed by the Hindu in Imphal where the party leader has claimed that the BJP will emerge as the single largest party in the state. “Going by the trend BJP will emerge as single largest party in manipur. Trend shows negative voting against Congress. We expect to win 25; hoping to get support of other parties,” Madhav was quoted by The Hindu. 12:35 pm: Nemcha Kipgen wins the third seat for BJP in Kangpokpi constituency. The leader defeated independent candidate Kharga Tamang by over 2297 votes to register his victory. NPF’s Awangbow Newmai won the party its third seat in Tamei beating BJP’s Z Kikhonbou Newmai by a close margin of 747 votes. 12:20 pm: Congress wins its eighth seat seat as D.D. Thaisii defeats BJP’s Yuh Jonathan Tao by 4293 votes in Karong constituency. N Loken Singh has also won for Congress from Nambol beating Thounaijam Chaoba in a close fight with a small margin of 280 votes. Congress is beginning to take a healthy lead over BJP and if the trend continues, might go on to register majority in the state. 12:10 pm: Congress gained its sixth seat in Khundrakpam constituency where Thokchom Lokeshwar Singh has won the seat by beating BJP’s T Mohendro Singh by a margin of around 3000 votes. NPP’s L Jayantkumar Singh has won from Keishamthong constituency beating Congress’ L Ibomcha Singh by a margin of over 3000 votes. 12:05 pm: Congress recorded its fifth seat in Manipur as Konthoujam Govindas wins from Bishnupur, beating rival K Krishna Kumar Singh from BJP with a huge margin of 5278 votes. 11:55 am: Congress takes lead over BJP as they register fourth seat from Tipaimukh (st) where Dr. Chaltonlien Amo has defeated BJP’s Lallukhum Fimate by a close margin of 626 votes. NPF’s K Leishiyo has won the seat in Phungyar (st) constituency beating BJP’s Somi Awungshi by over 4500 votes. 11:48 am: Scenes from Manipur from where BJP has won two seats. 11:40 am: PRJA chief Irom Sharmila managed to garner only 90 votes in Thoubal constituency as she lost with a heavy margin to anti-incumbent chief minister Okram Ibobi Singh. The defeat is a huge blow to Sharmila’s aim to repeal AFSPA from the state and to bring about a change in politics. 11:30 am: Congress wins one more seat as Muhammad Abdul Nasir wins from Lilong constituency, while NPP opens account as Yumnam the former DGP of Manipur, Joykumar Singh wins from Uripok constituency. Singh wanted a ticket from BJP. But because of his controversial and unpopular term as the police chief, he was not given a ticket either by Congress or BJP. 11:25 am: K Joykisan Singh has won from Thangmeiband constituency beating BJP’s Jyotin Waikhom by a close margin of over 157 votes. With both the parties having won two seats each, the competition in the state is starting to heat up. It might be too early to call at the moment, but as of now neither party is going to get majority in the state. 11:10 am: BJP wins second seat in Manipur with Heikam Dingo Singh beating Congress’ K Devendro Singh in Sekmai constituency by a margin of over 2000 votes. As per latest trends, Congress is leading in 14 constituencies, while BJP is leading in 11. 10:55 am: The latest trends from Manipur: Congress has won 1 and is leading in 11, BJP has won 1 and is leading in 13. 10:48 am: The counting has just begun in hills. CM Okram Ibobi Singh, on Friday, had expressed confidence that voters will support his party in hills. 10:40 am: In Uripok, former DGP of Manipur, NPP candidate Yumnam Joykumar Singh is leading with 5787 votes, just 400 votes more than BJP’s Dr. N Dwijamani Singh. L Jayantakumar Singh is leading in Keishamthong with over 1000 votes ahead of Congress’ L Ibomcha Singh. 10:33 am: The early trends shows BJP and Congress in neck-and-neck competition. Both BJP and Congress has won one seat each in the state. 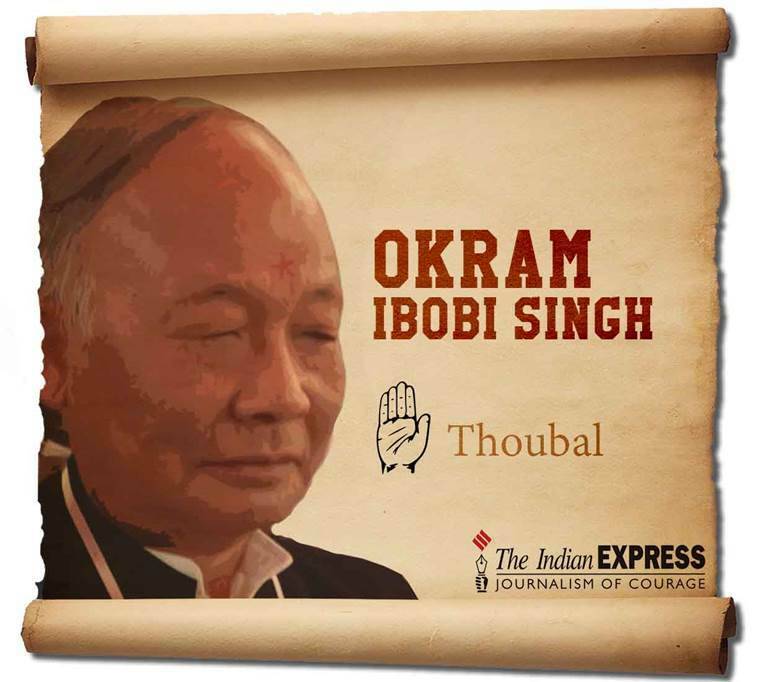 Manipur CM Okram Ibobi Singh has won from Thoubal. BJP’s Sapam Ranjan Singh has won from Konthoujam seat beating Congress K Sharat Singh with a gap of around 4000 votes. 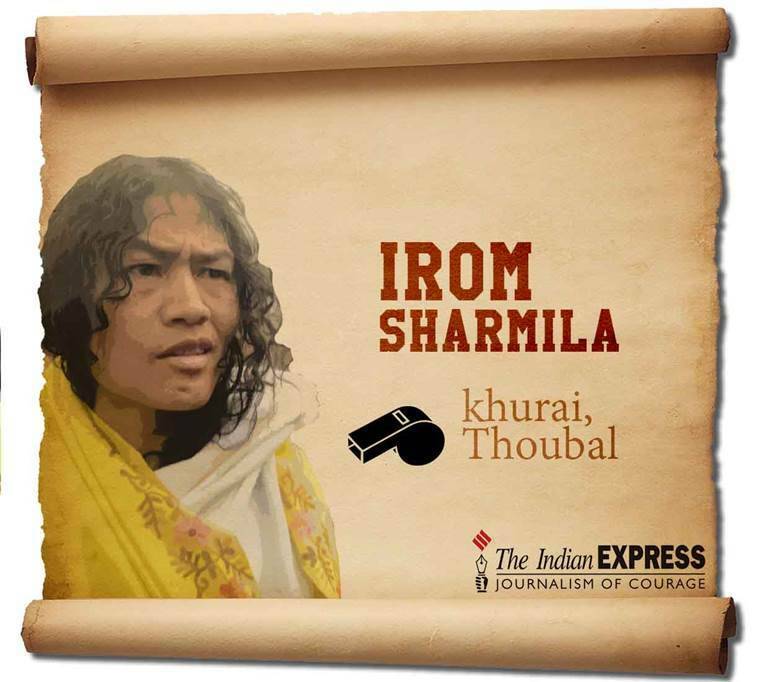 10:10 am: Irom Sharmila has lost in Thoubal to Chief Minister Okram Ibobi Singh. The activist gave up her 16-year long hunger strike to contest Manipur elections and formulated People’s Resurgence and Justice Alliance (PRJA) party with the sole agenda of repealing of AFSPA from the state. Sharmila claimed that she has not given up the fight against the act but has only changed her strategy. On Saturday morning, speaking to news agency ANI, Sharmila said that she will contest 2019 general elections if she does loses this time around. 10:00 am: Latest trend from Manipur shows BJP gaining lead over Congress in the state. A victory in Manipur will be a major upset for Congress, who have ruled over the state for last 15 years. BJP moved towards establishing its presence in north-east as soon as it came into power in 2014. The party gained its first big victory in Assam in 2016 and now the party rules in Assam and Arunachal Pradesh. A victory in Manipur will be a big boost for the saffron party. 9:42 am: BJP takes lead in several constituencies including Chandel (st) and Wangoi. The competition between both the parties has gone neck-to-neck with both the parties now leading in equal number of constituencies. 9:33 am: In spite of heavy campaigning by BJP in the state, the early trends show Congress leading in the state. The exit polls predicted BJP dethroning Congress after 15 years. But at the moment, Congress is looking to turn the tables around. Still, there is a long way to go in the elections results, and the situation in the state continues to remain a close-knit affair, with no clear picture in sight. 9:25 am: BJP’s Sapam Ranjan Singh is currently leading with over 400 votes ahead of Congress’ K Sharat Singh in Konthoujam constituency. BJP also has a small lead over Congress in Thangmeiband constituency. PRJA candidate Loichongbam Erendro trailing behind. 9:18 am: The competition between BJP and Congress is coming to a boil with both the parties fighting in neck-to-neck competition. Congress has taken lead in 8 seats, while BJP has lead in 6. Chief Minister Okram Ibobi Singh is leading in Thboubal constituency with BJP’s L Basanta Singh trailing behind with almost 2000 votes margin. Meanwhile, NPF candidate Losii Dikho is currently leading in Mao (st) constituency with BJP’s Woba Joram trailing with over 5000 votes. 9:06 am: Congress has taken the lead in six seats, while BJP is slowly picking up and has taken lead in five seats. No clear picture has still emerged from the state, even though early trends put Congress in front. 8:57 am: Congress appears to be defying the exit polls as they are leading in five constituencies at the moment, with two already in the bag. 8:48 am: Congress and BJP almost in a neck-t0-neck competition as both the parties look to take lead in one more seat. BJP is now leading in two seats, while Congress carries on its lead in three seats. 8:40 am: Congress has won two seats in Manipur as they are looking to gain a solid lead in the polls. BJP has opened its account by grabbing one seat. One seat has been grabbed by Others as the contest appears to get heated up. 8:37 am: According to news agency ANI, Okram Ibobi Singh is leading from Thoubal from where Irom Sharmila is also contesting for one seat. 8:30 am: First trend in Manipur sees Congress taking the lead. 825 am: Congress has struck early and has claimed one seat in the bag while (Others) have also claimed one seat. 8:20 am: Heavy security employed in the state as counting of votes from 60-member Assembly went underway at eleven centres. The entire state has been put under tight security blanket and prohibitory orders under Section 144 CrPC have been imposed near all counting halls, officials told news agency PTI. 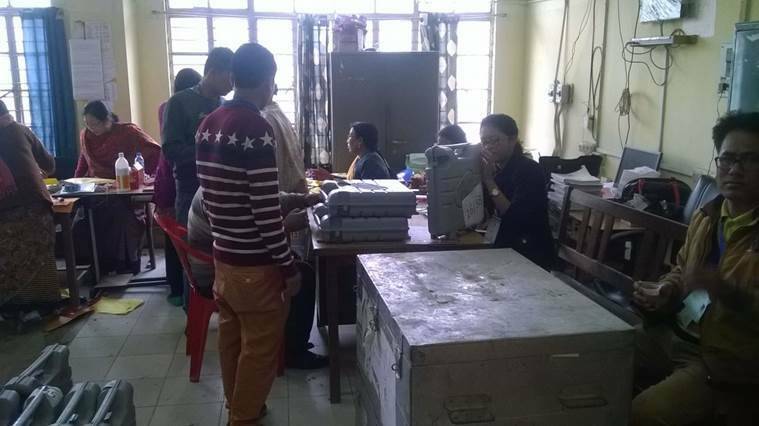 8:00 am: The counting of postal votes has commenced at counting booths in Manipur. 7:45 am: The political debutante Irom Sharmila said on Saturday that muscle power, money and influence was openly used by political parties in the state during assembly polls. 7:25 am: PRJA chief Irom Sharmila on Saturday said she is not much affected by the exit poll results. The activist also said that she will try again in 2019 General Elections in case of her defeat. 7:15 am: According to exit polls, BJP is likely to dethrone Okram Ibobi Singh led Congress government in Manipur and form the government. As per the surveys, a close fight is expected between the ruling Congress and BJP with C Voter giving 25-31 seats to BJP, followed by 17-23 seats to Congress and 9-15 seats to Others out of 60 assembly seats.